My favorite deity in Chinese myth - Erlang Shen (二郎神). Erlang is very often hailed nowadays as a god of war. But I’m not sure I agree with that role. The more traditional war gods in Chinese myth are actually Xing Tian (邢天) and Chi You (蚩尤), and I’d even argue that deities like Nezha (哪吒) is a more proper diety of war/battles than he is. Erlang is probably more accurately a martial god/sage (武圣). He’s less about the leading armies part of war and more about the kicking of butts. =P Hence, why he was called in to fight the Monkey King in “Journey to the West” when nobody else in the Heavens could match the monkey. 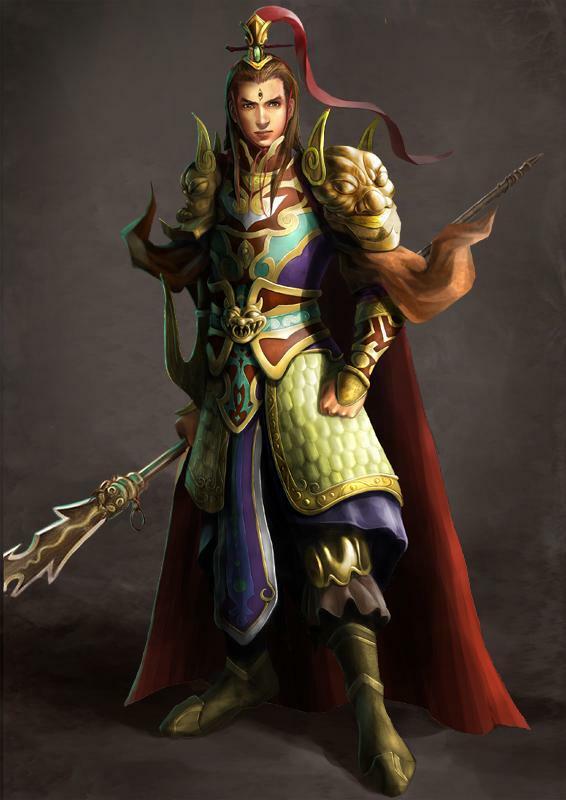 But he was not often shown as a front line army/squad leader during the Shang-Zhou war in “Canonization of the Gods”. More traditionally, he’s the patron deity of the Shu (蜀) region of China, which more or less encompasses the modern Sichuan region. (Kinda like how Athena was patron deity of Athens and so forth.) He’s also a god of the waterways (possibly civil engineering? ), credited with helping the historical figure of Li Bing (李冰) build the Dujiangyan (都江堰) Irrigation System. On a less serious vein, I also think he should be a deity of domestication (or Pokemon trainers XD). IIRC he’s the only major mythical figure who is associated with a varied retinue of pets. 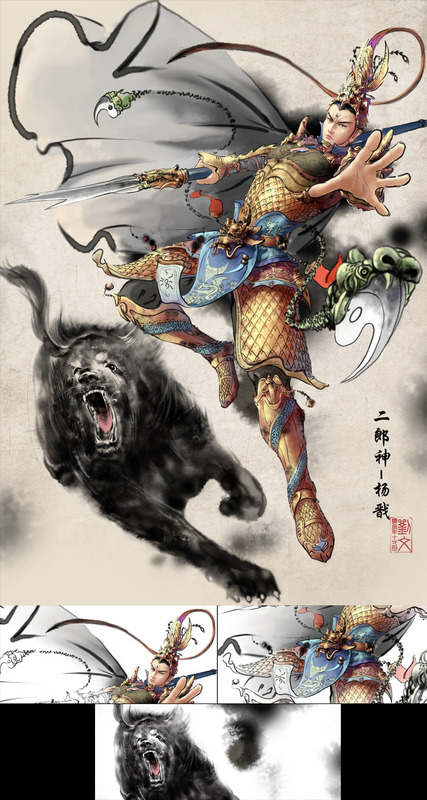 The most famous is the celestial hound Xiaotianquan (啸天犬), and he’s also known to have a hunting hawk and a silver horse. Fun fact - in “Canonization of the Gods”, all the other gods have a tendency to have one or a few major arcane artifacts which they would often use in during battle as their ‘ultimate attack’, in an RPG sense. Erlang, on the otherhand, never bothered with any artifacts. Instead, in the middle of battle, he would fling his dog out of his sleeve to maul his opponents face - to great effect. Now remember, in ancient China, the only pure breed of dogs is the ancestor of the modern Pekingese (and not the large bloodhound/german shepherd type dog that is depicted in more modern art). I have to admit, the mental image of a fluffy pekingese assassin puppy getting tossed out of a god’s sleeve made for a very hilarious mental image. Interesting analysis of the characters in BLD. I especially like some of the stuff in the comments. Article and discussion of Purity!Sues in BLD. Yes we all know that Journey to the West is a political commentary. So no big surprises on the numbers here. It's still some interesting info. And gotta admire the JttW geeks who took the time to compile it all. Not sure if it's the same one. Also see another version on veoh but it appears to be a HK version. Le sigh. Well, guess will try saving the youtube ones first. The first decent fics of the 杨戬/哪吒 genre that I could read through without getting the willies a paragraphs in. It helps that it's based on the "canonical" <封神演义> novel than on the various televised legends featuring the two of them. Links are to a BBS. Login shouldn't be required to read the threads, I believe. The second one is obviously a word closely associated with Buddhism. The first one does not appear to be so at first glance... In 封神榜, one of the daoist sects was 阐教. Is that still possibly a religious/semantic mixup by the author? EDIT: Entry in wikipedia seems to imply there was a daoist sect during the Ming/Qing dynasties by that name... or is that a rank thing... not sure I understand what it's saying. Anyhow, random thoughts while I was scrolling through Chinese myth-related pages. The term 日精月华 should look familiar; it's from Journey to the West. 日月精华 is the other term I see used sometimes in stories. So, we know Sun Wukong emerged from a rock after... thousands? millions? of years of absorbing 日精月华. Most other spirit creatures out there that originally were inanimate objects or animals also attained human form and powers from this. Kind of like in the Avalon myth, time is supposed to run differently in the heavens than on earth. The most common saying is that 1 day in heaven = 1 year on earth. So a 1 : 365 ratio. Because I am totally heads-over-heels for the Yang Jian (杨戬) of this show and thus must share my screencaps (and probably not-so-witty commentary). Do note that he doesn't show up until halfway through the show and it's only that half I'm posting. OK that's probably enough for one post if I don't wanna kill people's bandwidth or something... Will continue in future posts. So I've been reading the original text of 封神演义. Specifically I read the chapter (99) where all the peeps who got deified/canonized by the 封神榜 were listed. Some were daoists of quite established power from both the Zhou and Shang sides, some were normal human members of the imperial court (on both sides), and some were evil evil 妖怪 (from just the Shang side). And the only common link between them was they died at some point in the story. Interesting enough, there was no mention of those well known figures such as 李靖, 哪吒, 杨戬, etc. who survived to the end of the story, even though we know they were deities and held heavenly office by the time of the Han (Sun Wukong's little ruckus in heaven was 500 years before Tang). In the 封神演义 story, though, they were more daoists than heavenly officers (yet?). So I have to wonder if they got their positions later on in the years, or if they already had positions and were only momentarily deployed to the human world to participate in the whole ordeal. I can believe the latter for 杨戬, whos mythos had him alive and hoppin' back when there were still 9 suns in the sky, and the text mentions his hound specifically as a '仙犬'. Not so sure about 李靖 and sons, since 哪吒 had only graduated from inanimate (though celestial) object for 10 years or so. I doubt his previous incarnation could have held heavenly office. It's an interesting thing to ponder. EDIT: Actually, read the last chapter (100) and I guess it was the former case for them... "後来李靖、金吒、木吒、哪吒、杨戬、韦护、雷震子，此七人俱是肉身成圣。"
Reference: link - looks like they got it out of either 西游记 or 封神演义. Yeah my mom bought me the complete set when she went back to China. I've been watching the DVD and I'm halfway through the sequel. It's not too bad. Granted it's not on par with the original, but the original was a classic in its own right, and I doubt anyone expected the sequel to surpass it. But it do an adequate job on its own. The basic concept behind the sequel is that we start off with the group back at the Tang Imperial court and they mention a couple of interesting incidents while the emperor was looking at the sutras they brought back. The emperor asks them to tell him the story of what happened. And cue flashback sequence that lasts for the rest of the series. - So far all the stories have come from the original book canon. They didn't just make up new adventures on the way to the West. There was the Sun Wukong and his doppleganger one and the one where the Jade Emperor was doing the petty vengeance thing which were pretty cool to see. - Nice chemistry between the actors. A lot of Bajie/Wukong horsing around that really looked like *cough* another kind of playing around. Some Tangseng/Wukong & Tangseng/Bajie stuff to, which had me giggling even though it kinda reminds of Saiyuki and thus gives me creeps. - The choreography was pretty good. While they needed to have wire-fu for midair and underwater fights, I was glad to see they didn't go the whole Matrix CGI-fu route or Ranmaesque CGI-chi-blast route (I'm looking at you, 神雕侠侣 retake #564). And they had a decent amount of ground fights. - Bajie is kinda cute in his dumbness, and not just in the way he always picks on/get picked on by Wukong. - I think I'm in luv w/ the crown prince of the Dragon King of the East... ok I'll stop fangirling now. - The SFX was better than the original, which really can't say much, especially when I can look at the scenes and think - that looks like something a newbie to photoshop could do in 10 minutes. You'd think they'd improved a little more since the original series in the intervening years. - The songs/soundtrack. I mean... pop music? Even if you're not willing to reuse 敢问路在何方 or the opening theme, at least come up with a decent replacement that's within the same spirit as the original. - Sometimes, the dialogue is... well we know even the original version didn't lay it on thick with the (pseudo-)ancient Chinese talk (as opposed to ROTK), but some of those lines are way too modern, folks! According to the background essay on the Book of Gates, apparently the gate system of the underworld that it depicts is very similiar to the gate system in The Book of the Dead (not that I've noticed. sigh). The fact that this and other books put the passage through the gates before the judgment (weighing?) of the soul, I guess the there's quite a lot of stuff to take place before the Hall of Maat, chronologically. Since I don't wanna go back and look through the BotD for the exact refs there, I suppose I can use the BoG version of the 1-5th hours instead. According to this guide to the various underworld texts, The Book of the Dead isn't the main text for going into the Afterlife. It is the most popular, however, and it's the only that actually gets a *commoner* into "heaven", as opposed to heaven being a pharoah-only club. Since none of our characters are pharoahs (except for maybe the sons of Elrond, and even that's a stretch)... I guess we're stuck using that. Book of Heavens/Earth - stuff about the gods. Not neccessary for my use. Book of Caverns - apparently for the underworld journey of the king. I can excuse not using it by saying the commoners' path (by the Book of the Dead) being a different path than the path of the pharoah. Book of Gates - doesn't say who this is for. I'm guessing it mainly focuses on obstacles into the underworld. I guess I'll need to at least familiarize myself with this version as well. Amduat - the path of the sun god. Nothing much to do with the rest of us. Pyramid Text/Coffin Text - collections of spells, basically. They're mostly merged into the Book of the Dead anyhow. So no worries there.